The name Casino Classic drums up a warm feeling of nostalgia making you expect an authentic gaming experience online. This is far from the reality in this case. Casino Classic is boring at best and makes you nervous to deposit your money at worst. If by saying ‘casino’ you mean mindlessly pushing buttons all day, and by ‘classic’ you mean boring, than Casino Classic is the right place for you. When I hear the word classic I think of nostalgia. Imagine casinos as they once were, full of people for a great social atmosphere, lots of great games and service and an overall entertaining night out. 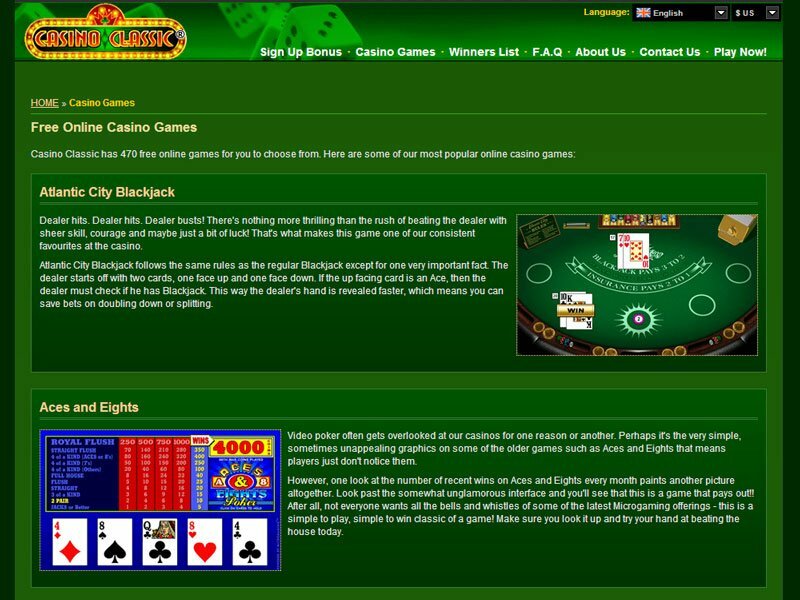 So an online casino called Casino Classic must be an attempt at recreating this wonderful atmosphere online right? Wrong. Apparently owners just threw out a name that would be easy to market and made their gaming experience as cheap as possible. 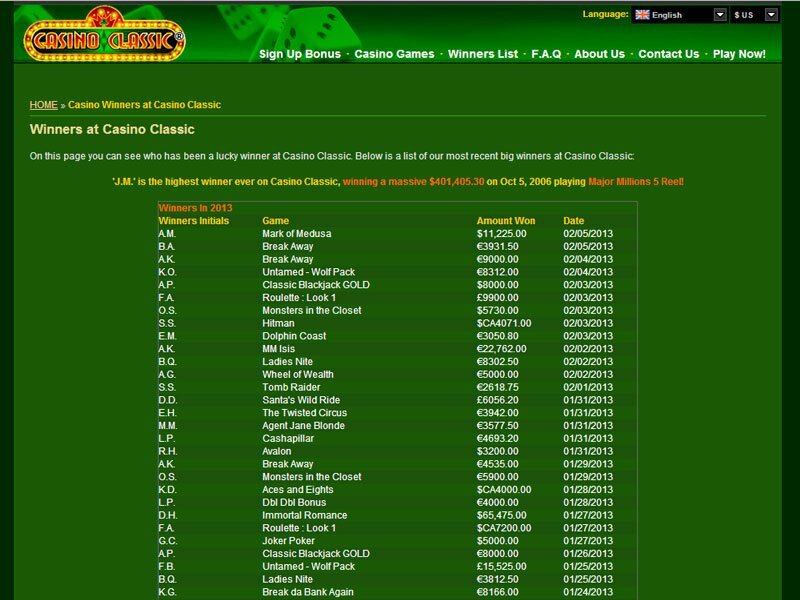 Casino Classic is powered by Microgaming, one of the largest and most well known online gaming software out there. Usually I’m a personal fan of Microgaming. They generally provide a huge suite of casino games most of which are good quality though a few are less than decent. I can only assume that in an attempt to save money, Casino Classic seems to have taken all of Microgaming’s worst options. I also have an issue with the Casino Classic welcome bonus they offer which just makes me feel like I’m being fooled into playing for something that I won’t actually get. Particularly in the slot machine arena, Casino Classic offers an extremely miniscule piece of the massive puzzle that normally makes up a Microgaming casino. The games at Casino Classic are all of the simplest quality visually and sound is poor quality or even flat out annoying. Other casino games come in much greater variety and live up to higher standards normally seen in Microgaming casinos. Banking options seem to be Casino Classic’s strong point with many of the best payment methods available for deposits and withdrawals. In fact many o the options are some of the less popular and simply less well known methods like UseMyFunds for example. 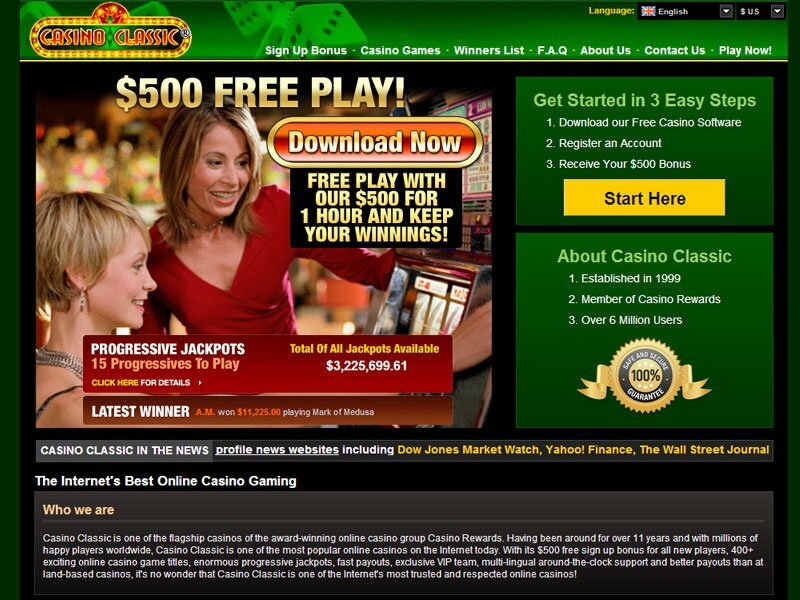 This properly ensures that no matter where you’re playing from or how you like to fund your gambling account, you’ll be welcomed at Casino Classic. Casino Classic maintains 24/7 support by phone in Canada, the United Kingdom, Denmark, Germany, and there is also an international number. They can also be contacted with questions or remarks by email or free online chat which is both instant and helpful.